Human populations are all more alike than they are different. Of course, this doesn’t mean there are no individual human population adaptations to specific environments. Skin color is often an adaptation to differing levels of sun exposure. If you live in a cold environment where you’re usually bundled in furs, it might be important to have pale skin which collects more vitamin D from the sun. If you live in a hot environment near the equator where your skin is exposed to sun much more often, darker pigments might help you to cope with sunburn. Recent research has shown that some human populations have evolved to better withstand life in the mountains. Findings published in American Society of Human Genetics reveal the adaptation of humans to high elevation in Peru. Researchers analyzed DNA from pre-Columbian remains in an effort to discover adaptations before indigenous populations were put under new pressures by contact with Europeans and their diseases. People in the Andes aren’t alone in adapting to high elevation and it’s interesting to consider that adaptations to similar environments may have evolved in different ways. Sherpas have long been known as some of the best people to support mountaineering expeditions. It’s a little trickier to tease out why Sherpas would be good for mountain travel. Sherpas are an ethnic group native to the Himalaya, mainly Nepal but also China, India and Bhutan. Sherpas were originally a nomadic group of people spreading from the Solukhumbu District of Nepal along salt trade routes. Trading in salt often meant long journeys on foot leading yaks burdened with bags of salt through rugged mountains. It isn’t hard to imagine that this type of lifestyle might help prepare someone for assisting in mountaineering trips to peaks like Everest. The real question is, are Sherpas good mountaineers simply because of experience in the mountains or are they actually adapted to high elevation on the genetic level? For anyone endeavoring to climb the world’s high mountains, acclimation is key. Acclimation is the relatively quick process a human body undergoes to deal with its environment. With acclimation to high elevation for instance, the body produces more red blood cells than normal. Adaptation is a different process, it is a process of evolution occurring over generations to create an organism better adapted to a certain environment. In the case of adaptation to higher elevation, this may mean larger lungs for instance. Last year, we reported on a study looking at whether Sherpas were adapted to higher elevation or not. Two groups, one of Sherpas and one of people from lower elevations made their way to Mt. Everest Base camp, with differences being noted by researchers. It was found that Sherpa’s mitochondria were more efficient at production of ATP with lower levels of oxygen. ATP is incredibly important for all cellular activities in organisms. Sherpas showed better able to deal with lower levels of ATP as well. How the lowlander’s bodies changed showed something interesting as well. As elevation increased, it appeared that the bodies of people from lower elevation continued to change in response to prolonged exposure to high altitude. The Sherpa’s measurements stayed roughly the same, suggesting a true adaptation to elevation instead of acclimation. Research published in 2010 in Plos Genetics suggests that Sherpas aren’t the only people adapted to high elevation. People living in Tibet, not far from the Sherpa homeland, have also been shown to exhibit unique circulatory and respiration adaptations. This is no surprise. As Earth.com reported last year, the earliest evidence of human occupation on the Tibetan Plateau is between 7,400 and 13,000 years old, much older than archaeologist initially estimated human occupation. Humans have been living in the Tibetan Plateau for a long time, despite the fact that it averages more than 13,000 feet above sea level with about 60% of the oxygen levels as sea level. Why people moved to such high elevations so long ago, we may not completely understand, but it clearly happened elsewhere in the world. Historyworld.net reports that a ceremonial site in Peru shows that people lived in South America as long ago as 3000 BC, making them contemporary with ancient Egypt. The pyramids and raised platform testifying to the presence of people so long ago are located 10,000 feet above sea level. It’s worth noting that the Inca and other Native Americans of the Andes region didn’t have any real beasts of burden, nothing like a horse that could be ridden. Instead everyone travelled by foot or were in the case of royalty, carried on liters. Messages were sent through the Andes by people running as fast and far as possible over a system of roads. Clearly from its inception, life in the Andes was a taxing one, only made harder by the elevation. 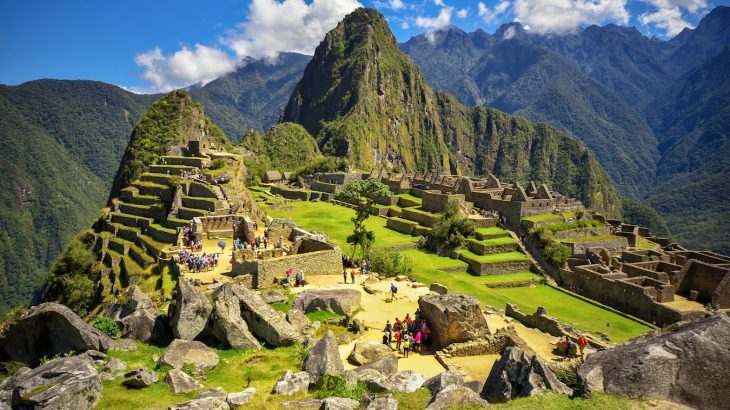 Science Daily reported in October, 2018 that new research shows that ancient people of the Peruvian Andes adapted to high elevation in a different way than their Himalayan counterparts. Analysis comparing the two separate genetics show there are some distinct difference. Earlier research shows there are also some similarities but variation in these similarities. Andeans adapted in other ways to high elevation. Sophisticated Andean agriculture show stepped fields that can create microhabitats in which a broad variation of crops can be grown. Housing and clothing differ markedly depending on the elevation certain people live at. Llama and alpaca wool were utilized and are still useful for travelling at high elevations with cold climates. All of this and the archaeological evidence point towards a long history living in the Andes. The example of other people living in the Himalaya also point to the importance of genetic adaptations to living at high elevation. It’s therefore interesting that the genes selected in the Tibetans aren’t the same ones selected in the Andean peoples. So the nature of the adaptation of people in the Peruvian Andes remains something of a mystery, an ongoing question of how people on the other side of the planet from the Himalaya adapted to similar conditions. Only further research will answer the question fully.